Migrants being transferred from the Lampedusa centre. Credit: Caritas Italiana. Ahmed (name changed) is from Africa but he has been living in Italy for 22 years now. On Dec. 20 the police stopped him and asked for his documents. Ahmed does not have them, and so has been kept in the Ponte Galeria Centre for Identification and Expulsion (CIE) of Rome since then. “It’s been two months now, but it feels like two centuries,” he told IPS on phone from the centre. 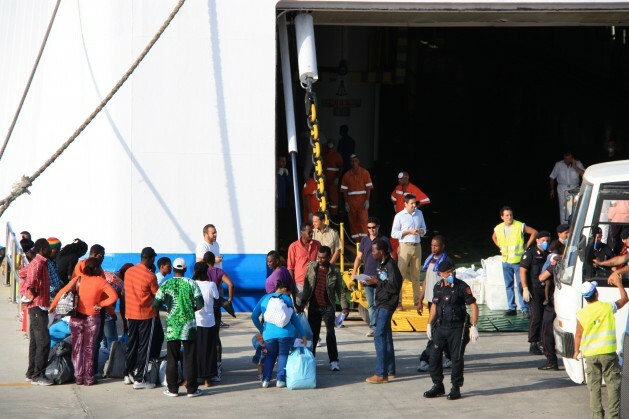 Last month, the Caritas Italiana and Migrantes Foundation published their annual dossier on migration, which states that “the true reform of the repatriation system would be the closure of the centres.” Oliviero Forti, director of immigration issues at Caritas explained to IPS the reasons behind such a strong recommendation. The CIE is a part of the Italian system of reception and identification for migrants. Besides, there are the centres of reception (CDA is the Italian acronym), the centres of reception for asylum seekers and refugees (CARA) and the centres of first aid and reception (CSPA). The CSPA in Lampedusa, Sicily, caused outrage when a national newscast circulated a video of naked migrants sprayed for scabies in the December cold. The CIE are centres for migrants who have no resident permits or identity documents, and for those who have received a deportation order. Yet, as the Caritas and Migrantes dossier reports, the available places are far fewer than the number of migrants in such a state. As a consequence, placement is decided on a case-by-case basis, following such informal criteria as whether the person is considered a danger to society and whether the chances of identifying and deporting the person are high. This brings disparity in treatment often based on nationality. Khalid Chaouki, Italian MP from the Democratic Party, visited the Ponte Galeria CIE following a protest by some inmates who literally sewed their mouths shut in January to draw attention to the conditions at the Rome centre. “The situation there was even worse than in Lampedusa, because it is in fact a prison outside the law, where people who often haven’t committed any crime are detained for months,” he told IPS. Migrants who should be in other centres are often kept in the CIE. “Unfortunately we often found women victims of trafficking, minors, stateless people and also EU citizens, Romanians for instance,” Gabriella Guido, spokesperson for LasciateCIEntrare (Let Us In) told IPS. LasciateCIEntrare is a campaign that began in 2011 after then Italian minister of the interior banned media access to the centres. But there is political opposition to this idea. Nicola Molteni, Italian MP for the Northern League told IPS that Italy has been a victim of the “indulgent political behaviour of the last two governments” and that it has been abandoned by the European Union. At the other end of the political spectrum, Chaouki says the CIE centres are an ideological flag of the Northern League, that have solved no problems. “We need to develop alternatives to those centres, we need to open new regular channels of access to Italy, new procedures of reception and also of deportation that are not harmful to people,” he told IPS. According to the Caritas dossier, of the 35,872 expulsion proceedings in 2012, 18,592 resulted in actual expulsions. In all 7,944 foreign citizens passed through the CIE, of which only half were eventually deported. “Despite the huge amount of money spent to maintain these places, they don’t even serve the purpose they were created for. Our conclusion is that their function is rather to placate the anxiety of those who perceive migrants as a threat to security,” said Forti.